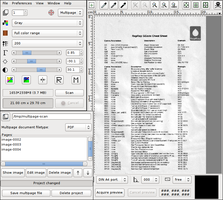 I use XSane to scan documents for my digital archive. I want them to be in PDF format and have a reasonable resolution (better than 200 dpi, so I can try OCRing them afterwards). 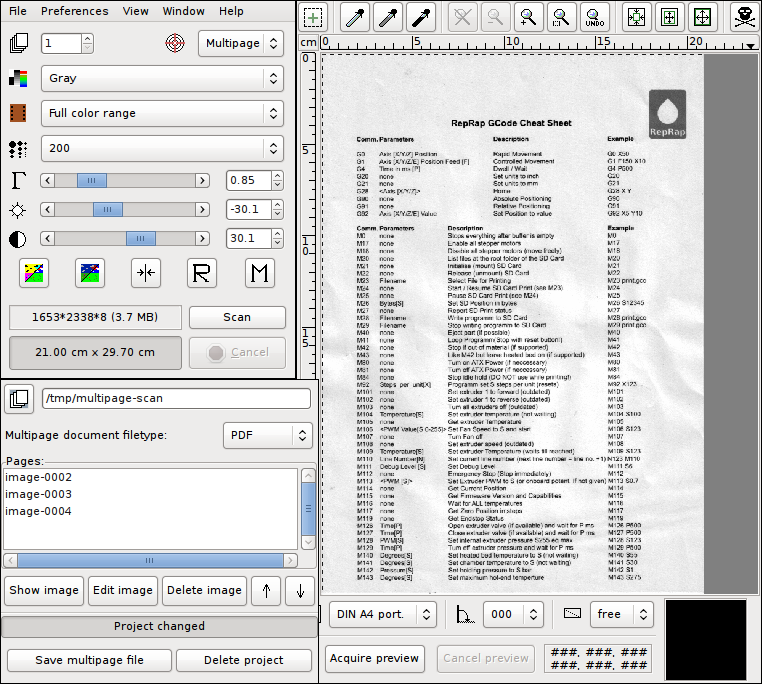 However, the PDFs created by XSane’s multipage mode are too large, about 250 MB for a 20-page document scanned at 200 dpi. At first, I tried to optimize the PDF using GhostScript. I already wrote about how GhostScript’s -dPDFSETTINGS option can be used to minimize PDFs by redering the pictures to a smaller resolution. In fact, there are multiple rendering modes (screen for 96 dpi, ebook for 150 dpi, printer for 300 dpi, and prepress for color-preserving 300 dpi), but they are pre-defined, and for my 200 dpi images, ebook was not enough (I would lose resolution), while printer was too high and would only enlarge the PDF. The best thing to do was to find out how the images were embedded in the PDF. Since most PDF files are also partly human-readable, I opened my file with vim. 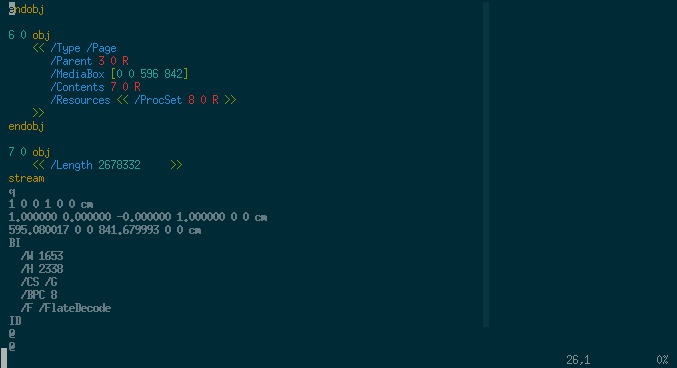 (Also, I was surprised that vim has syntax highlighting for PDF.) Before we continue, I'll give a short introduction to the PDF file format (for the long version, see Adobe’s PDF reference). interpreted as literal characters when enclosed in parentheses: (This is a string.) These can contain escaped characters, particularly escaped closing braces and control characters: (This string contains a literal \) and some\n newlines.\n). interpreted as hexadecimal data when enclosed in angled brackets: <53 61 6D 70 6C 65> equals (Sample). starting with a forward slash, like /Type. You can think of them like identifiers in programming languages. key-value stores, which are enclosed in double angled brackets. The key must be a name, the value can be any object. Keys and values are given in turns, beginning with the first key: << /FirstKey (First Value) /SecondKey 3.14 /ThirdKey /ANameAsValue >> Usually, the first key is /Type and defines what the dictionary actually describes. a collection of bytes. In contrast to strings, stream objects are usually used for large amount of data which may not be read entirely, while strings are always read as a whole. For example, streams can be used to embed images or metadata. Streams consist of a dictionary, followed by the keyword stream, the raw content of the stream, and the keyword endstream. The dictionary describes the stream’s length and the filters that have been applied to it, which basically define the encoding the data is stored in. For example, data streams can be compressed with various algorithms. Represented by the literal string null. Every object in a PDF document can also be stored as a indirect object, which means that it is given a label and can be used multiple times in the document. The label consists of two numbers, a positive object number (which makes the object unique) and a non-negative generation number (which allows to incrementally update objects by appending to the file). Indirect objects are defined by their object number, followed by their generation number, the keyword obj, the contents of the object, and the keyword endobj. Example: 1 0 obj (I'm an object!) endobj defines the indirect object with object number 1 and generation number 0, which consists only of the string “I'm an object!”. Likewise, more complex data structures can be labeled with indirect objects. Referencing an indirect object works by giving the object and generation number, followed by an uppercase R: 1 0 R references the object created above. References can be used everywhere where a (direct) object could be used instead. Using these object, a PDF document builds up a tree structure, starting from the root object, which has the object number 1 and is a dictionary with the value /Catalog assigned to the key /Type. The other values of this dictionary point to the objects describing the outlines and pages of the document, which in turn reference other objects describing single pages, which point to objects describing drawing operations or text blocks, etc. Now that we know how a PDF document looks like, we can go back to out initial problem and try to find out why my PDF file was so huge. I will walk you through the PDF object by object. This is just the magic string declaring the document as PDF-1.4, and the root object with object number 1, which references objects number 2 for Outlines and number 3 for Pages. We're not interested in outlines, let's look at the pages. We see that object number 6 is a page object, and the actual content is in object number 7. More redirection, yay! So now we know why the PDF was so huge: the line /F /FlateDecode tells us that the image data is stored losslessly with Deflate compression (this is basically what PNG uses). However, scanned images, as well as photographed pictures, have the tendency to become very big when stored losslessly, due to te fact that image sensors always add noise from the universe and lossless compression also has to take account of this noise. In contrast, lossy compression like JPEG, which uses discrete cosine transform, only has to approximate the image (and therefore the noise from the sensor) to a certain degree, therefore reducing the space needed to save the image. And the PDF standard also allows image data to be DCT-compressed, by adding /DCTDecode to the filters. Now that I knew where the problem was, I could try to create PDFs with DCT compression. I still had the original, uncompressed PNM files that fell out of XSane’ multipage mode (just look in the multipage project folder), so I started to play around a bit with ImageMagick’s convert tool, which can also convert images to PDF. convert generally takes parameters of the form inputfile outputfile, but it also allows us to specify more than one input file (which is somehow undocumented in the man page). In that case it tries to create multi-page documents, if possible. With PDF as output format, this results in one input file per page. Next, I converted the PNMs to JPG, then to PDF. With that approach, I could reduce the size of my PDF from 250 MB with losslessly compressed images to 38 MB with DCT compression. There is probably software out there which does those thing for you, with a shiny user interface, but I could not find one quickly. What I did find though, was this detailed article, which describes how to get high-resolution scans wihh OCR information in PDF/A and DjVu format, using scantailor and unpaper. Also, Didier Stevens helped me understand stream objects in in his illustrated blogpost. He seems to write about PDF more often, and it was fun to poke around in his blog. There is also a nice script, pdf-parser, which helps you visualize the structure of a PDF document.